July 30, 2012 In News What is Michelle doing now? The PRC magazine feature was about the two designers behind the pool project for Mandarin Oriental Singapore, illustrated with imagery shot by Michelle Chaplow. The feature talks about “the power of collaboration”. Designers J Lee Rofkind and Dennis Selinger met about 15 years ago working on the Hyatt in Hangzhou (Rofkind as Design Director for Hyatt International, and Selinger as a landscape architect). The two designers hit it off immediately, with shared design sensibilities, and over time have become good business friends and office partners – Rofkind now has his own creative design consultancy. Read more. This magnificent hotel is magically located on the banks of the Vltava River, with views to the quaint streets of Malá Strana, Prague Castle and the Charles Bridge. 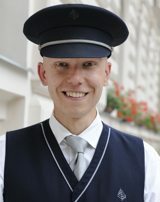 Michelle photographed the doorman, the flowers, the cutting-edge restaurant CottoCrudo, to name just a few of the shots. Read more. It’s an absolute privilege to see a city as a photographer for the very first time. Michelle relished every moment, and between photo assignments and breaks in the unpredictable weather, Michelle captured stock images of the Czech capital on camera. 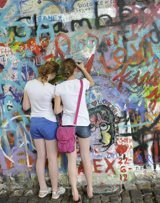 The John Lennon wall was of particular interest to Michelle. Since the 1980´s it has been filled with Lennon inspired Graffiti, great fun to watch tourists and locals alike pen their thoughts. A constantly changing piece of art as one drawing, quote or painting is covered by another. Layer upon layer of art. Prague is the home to Absintheries. 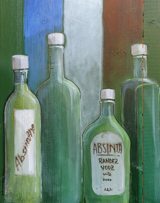 Absinthe is a highly alcoholic beverage, historical literature refers to the drink as “la fée verte” (the green fairy). Green anise, is used in production of absinthe. It was banned in many countries due to its very high alcohol content and exaggerated claims of how it could affect human behaviour, these claims were spurred on by the temperance movement. 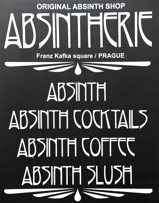 Nowadays Absinthe is making a modern revival world wide and Prague seems to be leading the way. Sudek´s studio is located in the Mala Strana district of Prague, hidden away in a quiet courtyard, so finding it is an adventure in itself. Michelle rang the bell, an old lady twitched the curtain, no reply; she returned three times during the day, and on the third occasion the old wooden door creaked open, leading to a dark passage and out into a courtyard of rundown apartments. Michelle was greeted by a barking dog and an elderly lady who spoke only Czech. Looking at Michelle’s camera, the lady pointed to a hand-painted sign indicating an old wooden shed. This was it – the very studio where Sudek, who lost an arm in the First World War, created the intimate series of photographs, “The Window of My Studio”, shot in this same courtyard with its twisted tree and lush gardens at 30 Ujezd, between 1940 and 1954. The wooden studio building burnt down in 1985, but thankfully it was rebuilt in 2000 as an exact replica, opening four years later as the Atelier Josefa Sudek. 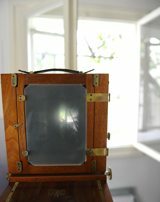 It is also the last remaining 19th-century garden photographic studio in the Czech Republic. Known as “the poet of Prague”, Sudek never married (he lived with his sister, who was also his assistant), was shy and retiring, and loved classical music. He spent days on end in Bohemian forests, photographing the trees on large-format cameras (with one arm!). Sudek produced some excellent images, using his unique style of contact prints, including many landscapes and innumerable shots of his beloved Prague. Sudek is regarded as one of the legendary photographers of the 20th century, and his work has been shown in exhibitions all over the world. The Pool of Life, a project inspired by the cutting-edge style of imagery currently emerging from the Helsinki School of Photography. Six female models were shot during a six-month period in abandoned swimming pools or ponds. The photography draws upon elements of light, body language, water and solitude, depicting a story of feminine inner reflection. You can never clearly see the model’s face within the series of images, and this lack of identity encourages the viewer, and in particular the female spectator, to engage and empathize with the emotions of the model. The images were presented and well received at the CAC (Contemporary Art Museum) in Málaga on 12 July. An exhibition is planned for later this year, so keep an eye out for more details in the next few months. Michelle’s opinions on the conservation of digital images were cited in an article by the Spanish press agency Efe. Her quotes were published alongside quotes from Spanish art historian Rafael Doctor, and David Clarke, head of photography at the Tate London. Her photographic work was also used to illustrate the feature. The article was syndicated to several countries, including, Spain, the USA, Chile and Peru. Planning for a one-day course for make-up artists, hair stylists and photographers, with Dubai-based international stylist Dennie Passion on 28 August.